Black and white image of a two horse team hitched to a fire wagon. Mud flaps hang just behind the horses' hind feet. A large bell is attached to the footrest of the wagon, and there are side rails where men can stand. A tank with a hose can be seen on the footboard, too. 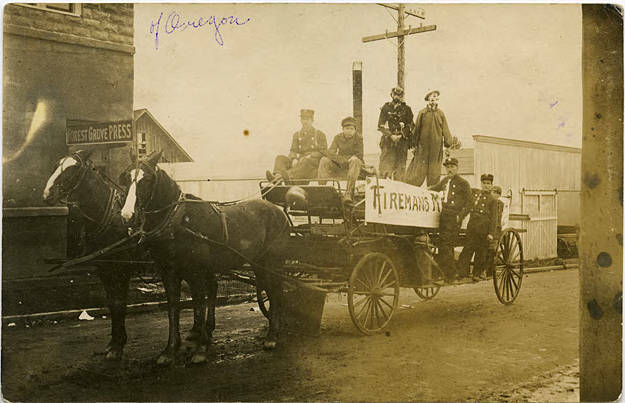 A man in uniform and a boy sit on the wagon seat, and two men, also in uniform, and another boy stand on the side of the wagon, which bears a sign reading 'Fireman's M [illegible].' Two men dressed as clowns stand in the wagon bed, one wears a sack type garment gathered at the neck and sleeves and ankles. The second wears what appears to be a partially rotted Union soldier's uniform, and his makeup could indicate that the Zombie Apocalypse has deep roots in western Washington County. A sign advertising the office of the 'Forest Grove Press' hangs from the building directly behind the team, while the next building on the street appears to be a livery or possibly the fire station. A power pole with crossbars stands behind the far corner of the wagon. [front] [purple pen] of Oregon.